Beloved artist Brother Cletus Behlmann, S.M., died Tuesday in San Antonio at age 82. He leaves behind a trove of truly unique art and countless fans and friends. He will never be far from their memory, thanks to each unmistakably colorful “Cletus” displayed in schools, offices, hospitals, chapels and homes around the country. “God Bless Brother Cletus for the many ways in which men and women experienced God’s grace, joy and sense of humor through his art,” said St. Mary’s University President Thomas Mengler, J.D. Funeral services will be Monday, July 18, at Holy Rosary Catholic Church. Viewing at 4 p.m. Mass at 5. Reception to follow in Conference Room A of the University Center. Behlmann’s health had been failing in recent years, forcing him into semi-retirement in December. Yet he still was able to provide a commemorative painting for the 100th anniversary of Fiesta Oyster Bake in April. It was his wish to be cremated and have the ashes interred at Maryhurst Cemetery in St. Louis. A Marianist brother and artist-in-residence at St. Mary’s, he began studying art in the late 1950s. At that time, he was teaching at a Marianist school in El Paso, and was given an assignment to do a charcoal drawing of a bean pot, which didn’t go well. “I had the worst time,” he said, according to his University of Dayton bio. In the summer of 1960, he and Brother Mel Meyer – another notable Marianist artist who passed away in 2013 – honed their craft with other young art aspirants in a tent in Chaminade Field on the St. Mary’s campus. Behlmann later studied at the Chicago Institute of Art and Washington University in St. Louis. 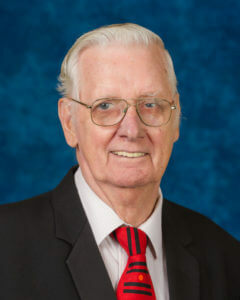 Behlmann taught for 19 years at St. Joseph School in Victoria, St. Joseph School in El Paso, and Maryhurst School/St. John Vianney High School near St. Louis. It was there he turned a chicken house into the Rooster Gallery to help educate Vianney art students, which he did until moving to San Antonio in 1977. Shortly thereafter, he opened the St. Mary’s University Art Center. The themes of his art are mostly religious, but overall, his work is a “celebration of life,” according to the website for his 36th Street studio, which he closed in December because of his health. The gallery will reopen occasionally during the next several weeks to give admirers one more chance to own a Cletus. Call Francisco Saenz at 210-601-5777 for more information. His art came in metal, acrylics, watercolor, batik, pastels, stained glass, ceramics, handmade paper, linoleum prints, crayon and other media. He’s been called “shockingly productive,” and his ubiquitous works around the city stand as evidence. He has painted all around the United States, as well as Japan, China, Hong Kong, Taipei, Bangkok, Europe and Central America. Behlmann was born Nov. 3, 1933 – the 11th of Mary A. and John H. Behlmann’s 12 children. He grew up on the family farm and attended Sacred Heart School and McBride High School, a Marianist school, in St. Louis, before earning his bachelor’s degree in English from St. Mary’s University in 1956. He took first vows on Aug. 15, 1953, and his perpetual vows on July 13, 1958, at Our Lady of the Pillar Church in Clayton, Missouri – 58 years ago tomorrow.